4 Bedroom Terraced House For Sale in Brighton for Offers in excess of £850,000. Situated on a prestigious road within the Montpelier and Clifton Hill Conservation Area, this elegant, four bedroom, terraced villa exudes classical style with its whitewashed exterior and period features such as high ceilings, cornicing and cast iron fireplaces. The property has been recently refurbished throughout and is now considered to be in very good decorative order, offering versatile accommodation over three floors. The house sits in the city centre, just moments from the high street, but on a wonderfully quiet, one-way road. The central hub of the house is the impressive double aspect 23ft sitting room with its log burner at the front of the house, with double doors out at the rear onto the side return, which leads to the garden beyond. The kitchen, which is less than a year old and still under warranty, is also at the rear of the house and opens out onto the side return as well, making for a great social space. Beyond the kitchen is a huge (ca. 23ft), glass-roofed sun-room which would work equally well as a dining room, additional reception room or kids play area. It is essentially open to the kitchen but is a separate space and floods the back of the house with natural light. The clean, contemporary kitchen with white, hi-gloss door fronts, granite effect work surfaces and integrated appliances, is bright and wider than one might expect at first glance. The main patio area is just outside and leads up to the garden which is slightly raised so gets a good amount of sun. The staircase leads up to a half landing where there is a useful vestibule area with shelving and a large storage cupboard housing the boiler opposite, which would make the ideal linen and cleaning cupboard. Beyond is a large family bathroom with both a freestanding bath tub and separate shower. Up a further few steps and you reach the first floor. Here there are two of four very well-proportioned double bedrooms, one at the front and one at the rear. The back bedroom overlooks the garden, whilst the front has built-in alcove cupboards and the benefit of the pretty bay window which looks down the street to the sea, above the rooftops. The second floor houses the two remaining double bedrooms which are near identical in proportion to the two below. The one at the front could be turned into a fabulous master bedroom as the view here is even more far reaching. The back bedroom is a good size and could therefore provide equal sized bedrooms for the kids. 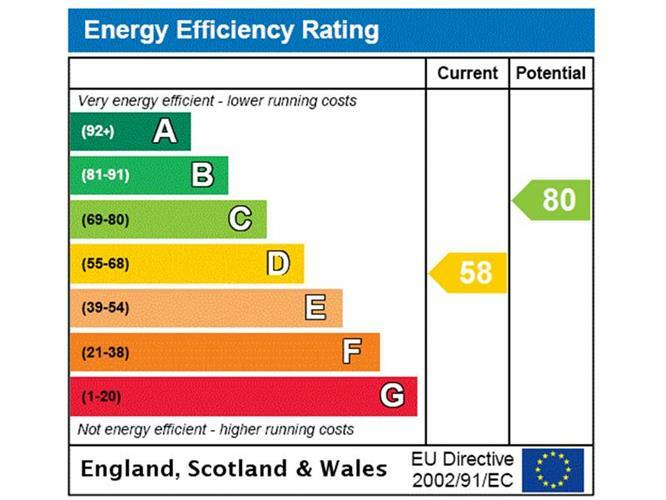 Alternatively (and Subject To Necessary Consents) some of it could be reallocated to create an en-suite for the bedroom, whilst still retaining enough space for use as a study or smaller double bedroom. This is a fantastic home, with space to suit myriad family configurations and with lots to offer. 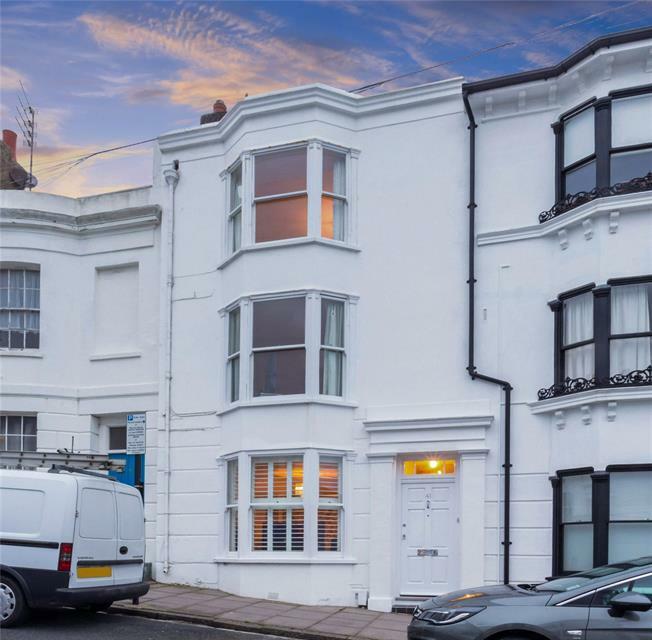 One of the most prestigious postcodes of Brighton, the property is set within the beautiful Montpelier and Clifton Conservation area. Nearby, the Seven Dials area offers a range of local amenities with shops, restaurants, whilst more extensive shopping can be found at Churchill Square (0.5 miles). Situated in the heart of Brighton the seafront is within 0.25miles and Brighton mainline train station is just over 0.75miles away. Access to the garden is via the sitting room and dining room with doors opening to a paved patio area ideal for alfresco entertaining, with a dedicated space for a barbecue. Steps lead up to an area of lawn enclosed on three sides by high brick walls, providing a sense of seclusion. On-street parking is available on Montpelier Street (permit required).